Jeff Lynne: Lead vocals, backing vocals, electric guitars, acoustic guitars & synthheizers. Bev Bevan: Drums & percussion Tympani. Richard Tandy: Piano, syntheizers & all other keyboards. Kelly Groucutt: Bass guitar & backing vocals. 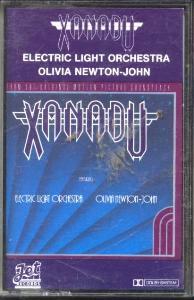 Olivia Newton John: Vocal on Xanadu. ELO is offered to write songs for the movie Xanadu and it achieves a 2 place in the UK and a 4 place in the US, whereas the film will be an economic disaster!. The single I´m Alive (May. 1980) achieves a 20 place in the UK and (12 June 1980) a 16 place in the United States. 2 single release Xanadu (June 1980) will be the band's first and only single no. 1 in the UK, with Olivia Newton John as vocalist and (11 Oct. 1980), it achieves an 8 place in the United States. 3 single release All Over the world (Aug. 1980) achieves a 11 place in the UK and (4 Oct. 1980), a 13 place in the United States. 4 single release Don´t walk away (6 Dec. 1980) achieves a 21 place in the UK. Xanadu wins Best Film Song, Theme or Score at the annual Ivor Novello Awards lunch d. 19. may 1981. Webmaster: Ken Stavensoe Nielsen, 17-12-2018.